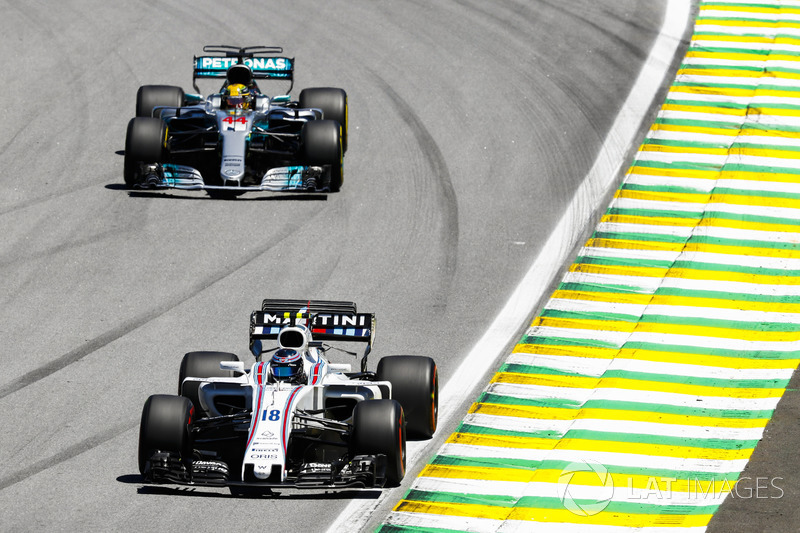 James Allen takes a strategic review of the Brazilian Grand Prix, where the end-of-term feel was apparent in the teams’ grand designs. 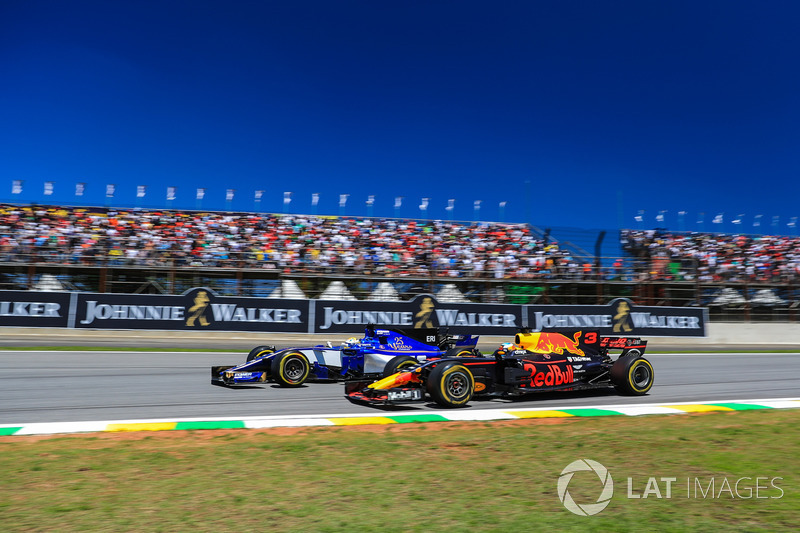 With the championship already decided there was a certain sense of ‘nothing to lose’ about the decision-making running through the penultimate race of the season in Brazil. 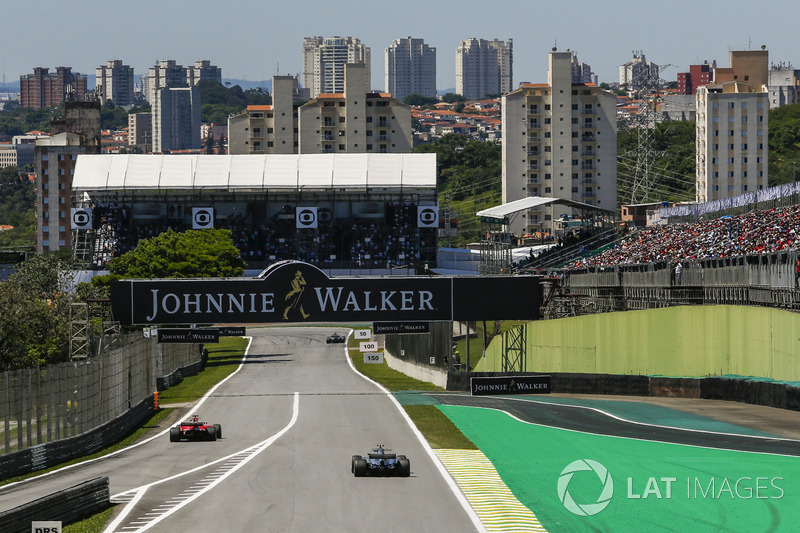 The combination of the tyre choices and the conditions at Interlagos meant that this looked like it could be a race with few strategic variations, and limited scope for an undercut tactic at the pit stops. 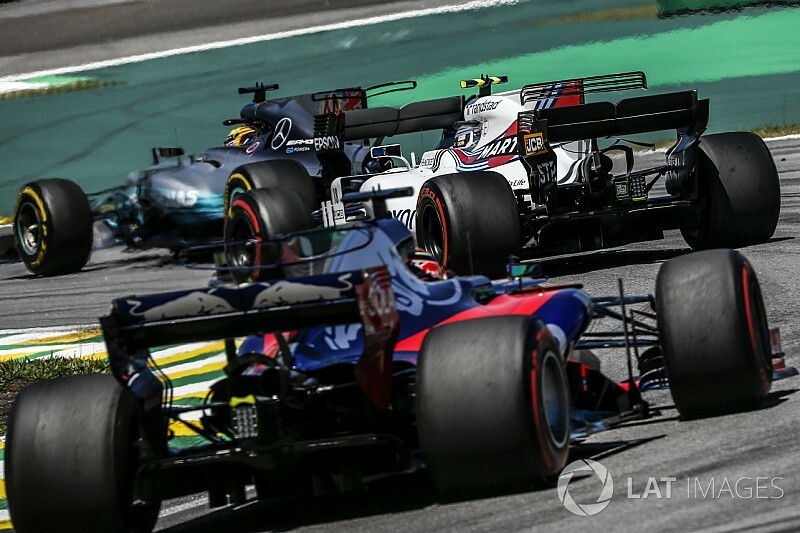 However, with two fast cars out of position after Lewis Hamilton crashed in qualifying and Daniel Ricciardo suffered a 10-place grid penalty, the race took on a different complexion. 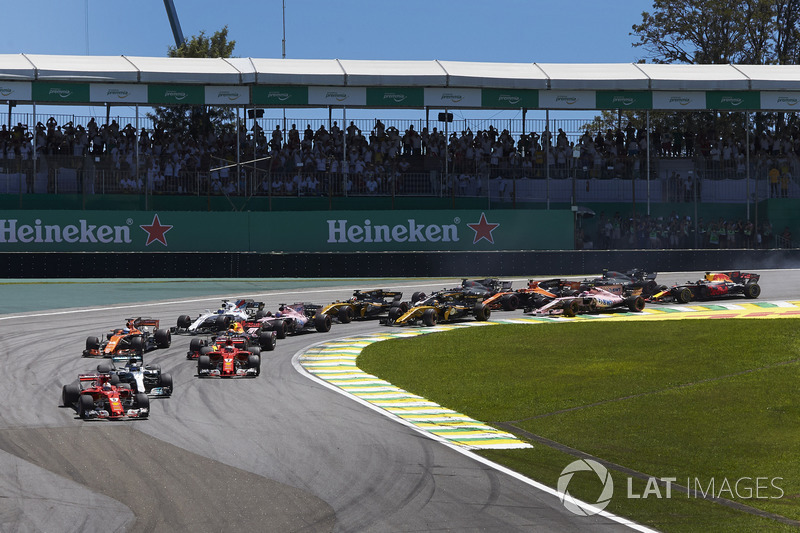 A Safety Car at the right moment, around Lap 18-20 might have given Hamilton the chance to win the race, but as it turned out the Safety Car was deployed far earlier than that and fourth was the best he could manage. 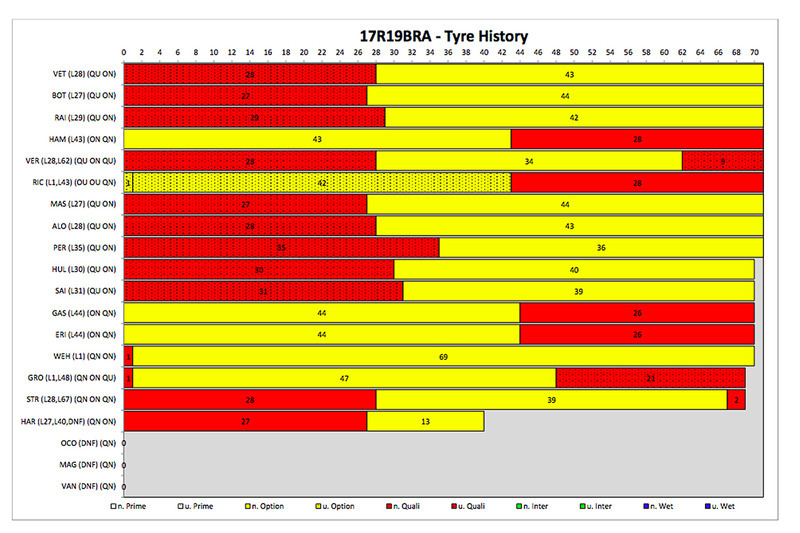 The two main tyre compounds Pirelli had brought to Interlagos were the supersoft and the soft. 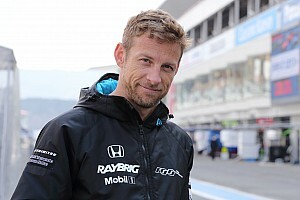 Friday’s practice running showed that it would be possible to do the race with just one stop as the degradation was very low, like in the Bridgestone tyre days in the 2000s. 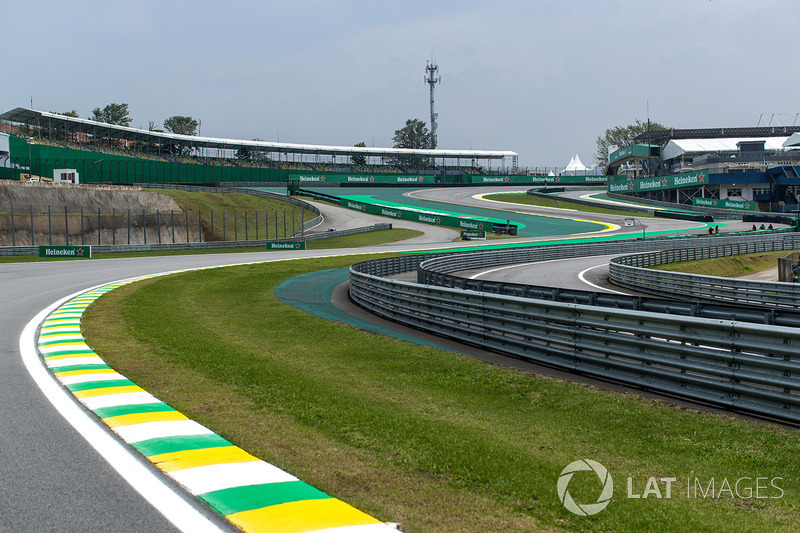 It also became clear from Friday that the best order for the tyres was soft first (when the cars were heavy on fuel) and then supersoft at the end, as the track ramped up in grip. 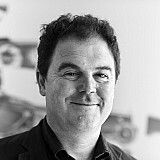 The other way around – the standard format for the Top 10 qualifiers – was tricky for the supersofts, which needed management against overheating. Knowing this, and also mindful that he had a 10-place penalty to serve that would mean him starting around P14/15, Ricciardo opted to qualify on the softs and do the mirror strategy to the Top 10, who would all be starting on supersofts. Sadly, he wasn’t able to fully capitalise as he had to be careful with running the engine too hard, and a first-lap incident took him to the back of the pack. Hamilton, had no such concerns in the race. 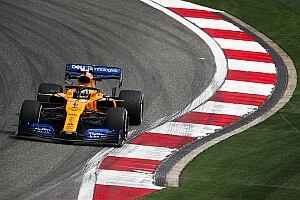 He had crashed on his first flying lap in qualifying and the decision was made to fit a new engine, which he could run at maximum mode for much of the race after starting from the pitlane. Clearly, starting on the softs was the best strategy for him, and he would be able to use the superior power of the engine to overtake cars. On race day the weather was hotter than in practice; the track was 60C degrees and this meant that the tyres overheated and suffered wear, but still not any meaningful degradation (drop off in lap time performance). What this meant was that the undercut (pitting before your rival ahead and then using the new-tyre pace to jump him when he stops a lap later) would be difficult to achieve. To make that really work, you need the degradation to be meaningful between an old tyre and a new one, so you can make the move when you are within two seconds of the car in front. 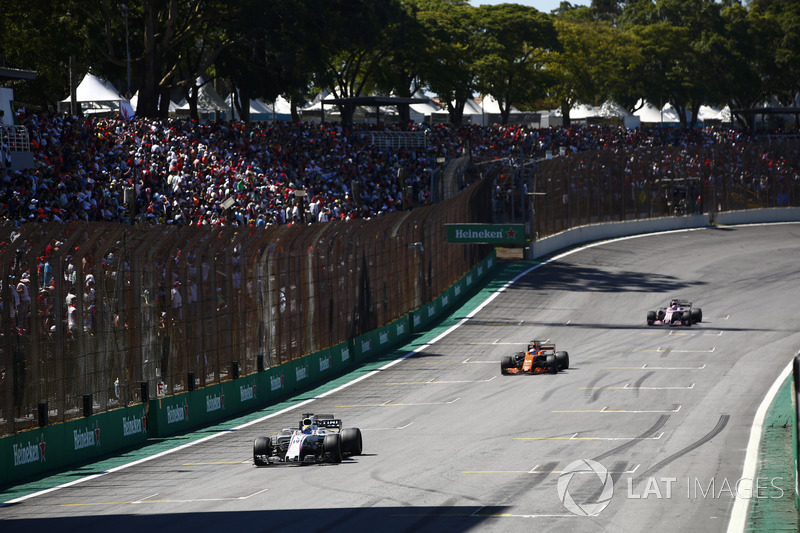 At Interlagos the undercut margin was only around 0.8 to one second, which meant that you have to be right behind to have any chance. 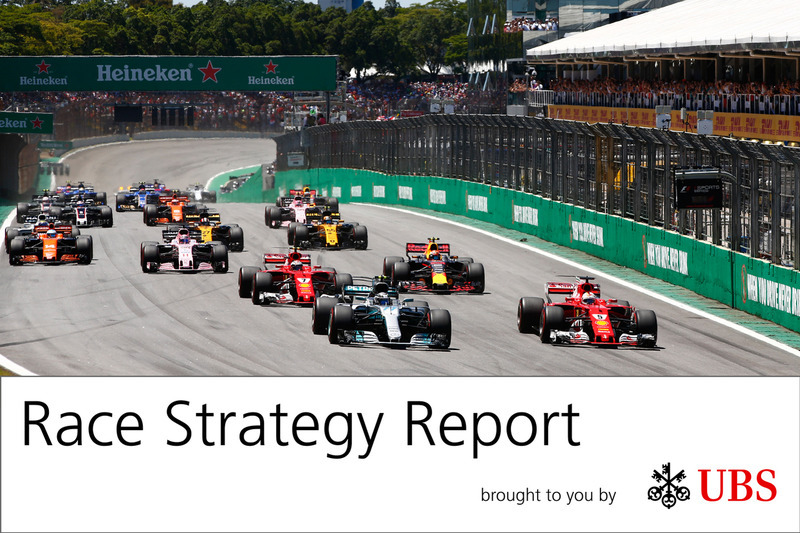 This in turn put the emphasis on the start and the opening lap as the place to make up positions. And when you have that situation, you have a strong likelihood of a collision and an early Safety Car – which is exactly what we got. Valtteri Bottas had the pole position in his Mercedes, but failed to convert it into a win because he lost the start. But he still had two more chances to get the lead back from Ferrari’s Sebastian Vettel. One was at the restart after the Safety Car, the other was at the pit stops – if he could get close enough for the undercut. He wasn’t able to challenge at the restart, as Vettel played a cat and mouse game with him before accelerating, like Hamilton had done with him in Baku. So it was all about getting close enough from Lap 26 onwards to have a go at the stops. From this point onwards the softs would be able to make it to the end of the race without too much difficulty. Mercedes moved Bottas into position and pulled the trigger on Lap 27, but Bottas came into his pit box a fraction too hot and the team lost 3/10ths of a second adjusting position to remove the wheels. Bottas would not have been ahead with a normal stop, but Vettel would certainly have been coming out of the pits into a drag race with him down to Turn 4. In the end it was more comfortable than that for Vettel. 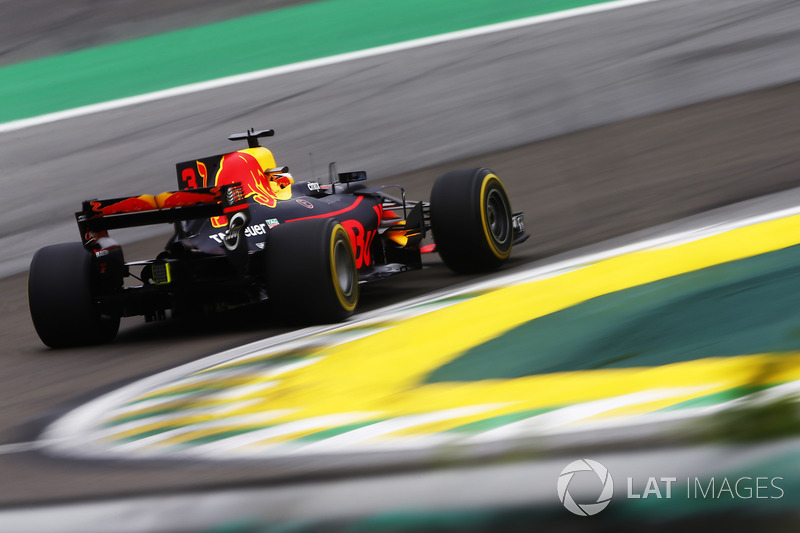 Ricciardo did a fine job to race from 14th on the grid to finish sixth at the flag on his mirror strategy. 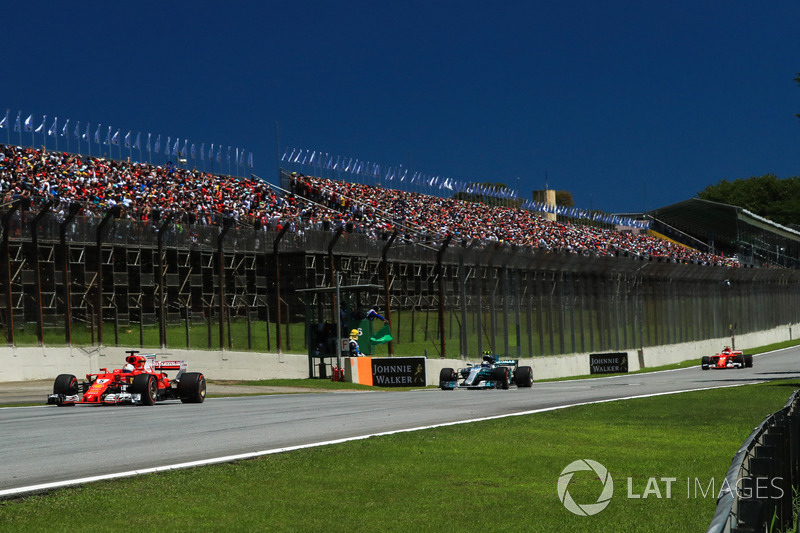 Although clocked at 338km/h with DRS and a tow on one lap, he did not enjoy the consistently enormous straight line speed advantage that Hamilton had with a new spec engine – sometimes as much as 25km/h faster on the straight than the cars he was passing – so it took longer to make progress. Ricciardo also wasn’t helped by contact on the opening lap, which dropped him down to 17th and last place. 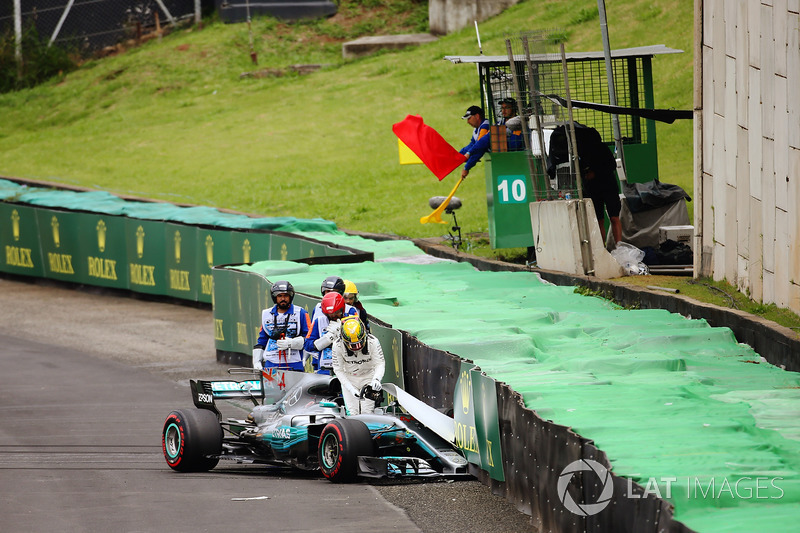 The accidents at the start helped Hamilton’s cause, boosting him to 14th place from 20th, but the Safety Car didn’t help him particularly. That’s because when he was racing Hamilton was able to pick off one car every lap – even two per lap in the early stages. 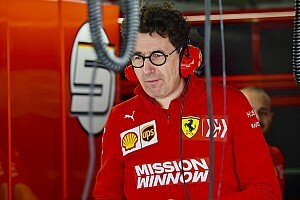 So the five laps behind the Safety Car meant five fewer opportunities to overtake in the early stages and gain ground. With low tyre degradation and a clear track ahead, Mercedes extended Hamilton’s stint by seven laps over the original plan to Lap 44. After his stop, Lewis mounted an attack on Raikkonen at the end, but had lost 1.5 seconds passing Stroll (see Lap 48 on table above) and with tyres that were worn, he didn’t quite have enough impetus to make a pass for a podium. Could Perez have beaten Massa and Alonso? Force India had a disappointing afternoon by their own high standards. Esteban Ocon’s long finishing streak came to an end due to a collision at the start with Romain Grosjean. 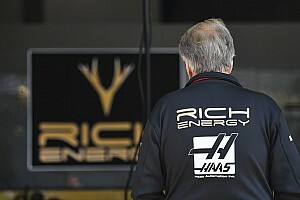 That resulted in his first F1 retirement after a season and a half! Sergio Perez started fifth on the grid, but finished ninth after losing out at the start to Felipe Massa’s Williams and the McLaren of Fernando Alonso. This tight midfield battle was a case study for the problem with the undercut. As the pit stop window opened on Lap 26, Alonso was one second behind Massa, and Perez was one second behind Alonso. That was close enough to try an undercut but neither McLaren nor Force India tried it. Perez would have benefitted most from it, as he was struggling to pass two cars, with Alonso able to get DRS from following Massa ahead. 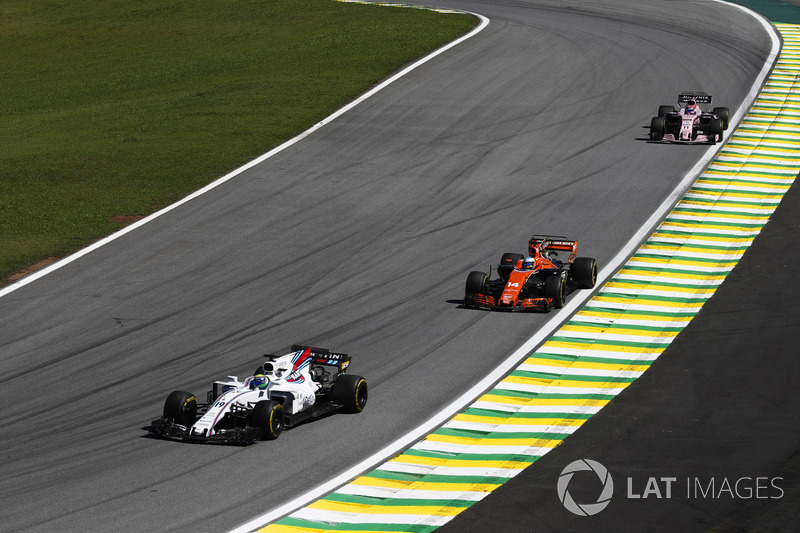 Massa had the luxury of pitting first on Lap 27 with no undercut attempt, then Alonso pitted and inevitably came out behind him. Perez and Force India, having missed the opportunity, decided to extend the stint and then try to make it up later on fresher tyres. He extended by seven laps, but lost too much time during that period and wasn’t able to get the benefit at the end. They crossed the line together in the same order in which they had raced. 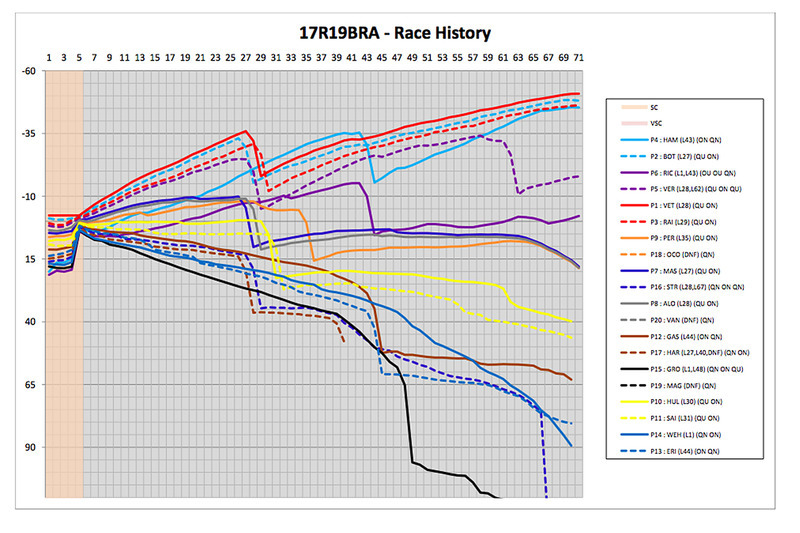 A graphic representation of the Race History (above) in terms of the lap times of each car. 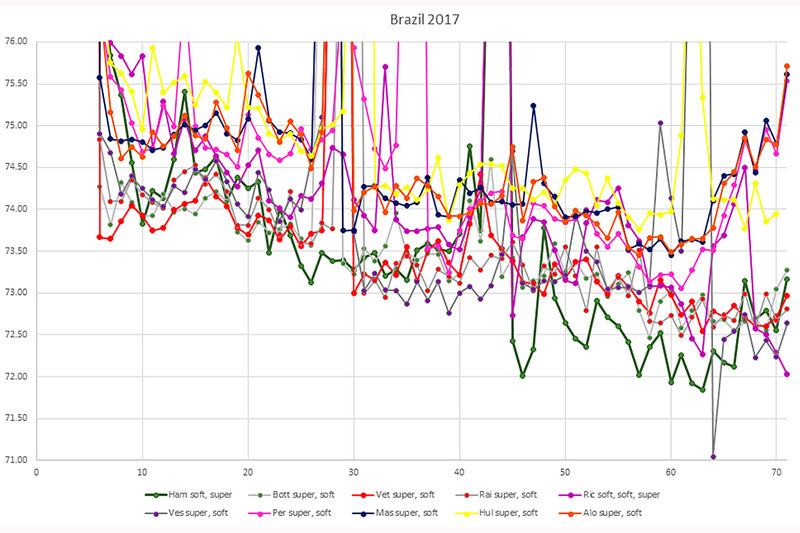 It shows the relative pace of the cars and the gaps between them in the race. Upward curve is good pace, downward curve demonstrates slower pace. Sudden drop is a pit stop.